As I mentioned in another thread I bought a used 422D Sunpak flash from a reputable ebay member. It arrived today and is in beautiful condition. However, it does not work. When first inserting the batteries, I hear the capacitor charge, and the ready/test light illuminates just as it should. It fired off with the test button, and the ready light came back on right away. But that was the end of it. Subsequent pushing of the ready/test button does not fire the flash. Also, after that initial capacitor charge and fire, after the first fire I do not hear the capacitor charging again even though the ready/test light comes back on. I've tried 3 different sets of fresh batteries with the same results. Only after I have taken the batteries out and let it sit for a half hour or more, it will work again for that same first fire and do the same afterward. I took a look at the manual about the battery saver function but that should not cause the effect I am getting. Usually Sunpaks just give up altogether when the magic smoke escapes from the innards. Have you tried trigger it from the hot shoe, either mounted on a camera or shorting the hot shoe contacts (bypass the test button). It is possible the button is just sticky. 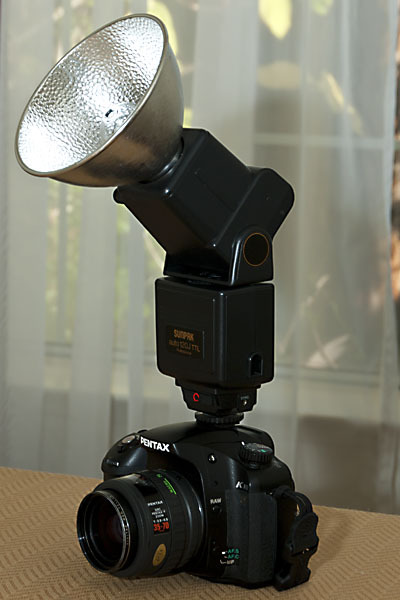 Since all my flashes are old flashes - I bought my Vivitar 285 new in the early 80s - it takes a little badgering to get them to work reliably if unused for extended lengths of time. Clean the battery contacts - if you haven't already, go to Radio Shack and buy a Deoxit Power Booster Pen. This is Deoxit contact cleaner in a pen like applicator with fiber tip. Excellent for cleaning off battery contacts - even if they look clean. Reach in the battery compartment and expand the contacts slightly - use gentle force - you don't want to break the contacts. You might have to make a hook or something with a paperclip if you can't get your fat fingers in there. Jiggle the battery compartment cover after inserting the batteries. Form the capacitor. With a fresh set of batteries set the flash to full manual power. Wait 30 seconds after full charge is indicated and trigger the flash. Repeat for a total of four or five times. Maybe the seller will let you keep the foot for a partial refund? I'd return the flash. This is not a case of "forming the capacitor" or "dirty contacts." If the "ready" pilot is on, but the "test" button does not fire the flash, it's not worth trying. Thanks for the input - I always want to be sure it is not something I am doing wrong before asking for a return. I did try it on my camera hotshoe with the same results. The battery compartment is super clean as is the whole unit. I agree with trying to clean the battery contacts, but the unit loads the capacitor perfectly the first time and fires - it's only the subsequent tries that it doesn't work. So with that, I feel the battery contacts are working properly. It's just that after the initial capacitor discharge, it won't recharge for some reason. I've written the seller with a detailed explanation of everything that I have tried. I feel fairly confident that he will make it right with me looking at his previous feedback and offering a return within 14 days. Giving a partial credit and keeping the module/foot is a great idea - I'll post back with my results. Yes, if one or more of the capacitors in the power circuit have leaked or dried out it can act flakey like that too. One of my Sunpak 433Ds does something similar but fiddling with the battery cover door solves the problem. Did you try removing the foot module and reinstalling it a couple times? Seems to me that mine was always a bit finicky when closing the lid on the battery compartment. I'd turn it on and hear nothing, fiddle with the lid, and suddenly I'd hear it charging. It's a long shot, but your unit could be the same. Good luck! I just tried your suggestion removing and installing the module - no difference. Actually it would not fire at all now - just a very weak dim light from the strobe when I push the button. I would say that the capacitor is shot. Sadly, I'd have to agree with you at this point. Still these are easy to find and the prices are reasonable for now. I'd return it, if possible and pick up another one. Too bad it doesn't work. It's a good flash. I am returning this one, but will definitely try another. I was impressed by the overall build quality as this one was in near perfect condition. It took me a few days to choose one in good condition. A lot of the ones listed on ebay don't have a photo or detail about the battery compartment. This one actually showed the unit powered on with the ready/test light illuminated and everything so I was pretty confident. Yes, the build of the 4xxD series (and the likes: 36DX, Super 383, ..., even the rebadged Quantaray) is really solid. I'm more impressed with it than with that of the current Pentax flash units. In the last three years, I went through at least 20 Sunpak 4xxD units (bought and sold) and have not run into a bad one. My current "go to" flash is a Sunpak 120J (same body design). Last edited by SOldBear; 01-21-2013 at 10:15 AM. There's a 422D with standard module never used by who claims to be the original owner on eBay. I found that one - thanks for posting about it. Just about pulled the trigger, but now got a little bit of a bad taste in my mouth when I printed the shipping label to return the ebay flash - $9.62. It was like throwing a $10 bill out the window. ... now got a little bit of a bad taste in my mouth when I printed the shipping label to return the ebay flash - $9.62. It was like throwing a $10 bill out the window. Why should you have to pay for the return postage? The product is defective - not your fault. You should NOT lose any money in the (broken) deal. My wife is a top plus plus (or whatever) seller on ebay. To get to this tier, you must offer the above terms - she can't even change that term if she wants to keep the top seller status. That's not saying that she can't or won't refund the return shipping - just that it doesn't really apply since she sells fabrics and yarn. Hard to get defective yarn. But....in the ebay world, no matter how hard you try, you will always get that disgruntled customer once in a while. Since her auction sales are small (usually $10-$20), if she gets that impossible person, she will just say "keep it and I'll refund your money" - very rare however. Since the flash was defective, I was quietly hoping the vendor for the flash would say just "keep it" and I'll just refund your money, but he requested I send it back which I am obligated to do. Also, the price of the flash was $24.00 plus $5.95 shipping (his actual shipping was $11.15 according to the label). I don't know if he is even obligated to refund me the original shipping of $5.95. Just looked at the details of the terms, and it just says "refund given as money back". So I am looking realistically at a refund of $24.00 which means I am out the original $5.95 shipping plus the $9.62 to ship it back - $15.57 total out of pocket loss for a broken $24.00 flash. This is why I rarely buy used electronic equipment on ebay.